The president of Guangdong Culture society Mr. Li and the president of the U.S. Business Unit Betty Li visited ZCCA on Nov. 19th for building good relationship between China and the U.S. They wanted to help Guangdong enterprises go globally and improve Guangdong's competitive strength on culture. 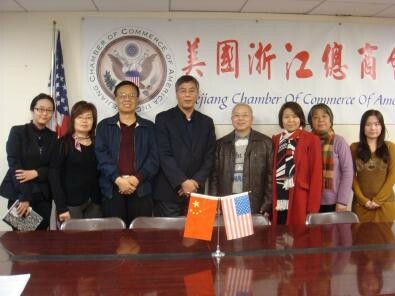 Mr. Li gave a brief introduction to Guangdong and learned many things about the U.S. He thought these things would be very helpful for Guangdong enterprises being global. Meanwhile, Lawyer Zhou introduced the problems caused by investment immigration, real estate, and litigation in the U.S. Also, the president of American Education United Association Amy Lin introduced some high schools, colleges of the U.S. and how Sino-American Educations could cooperate.